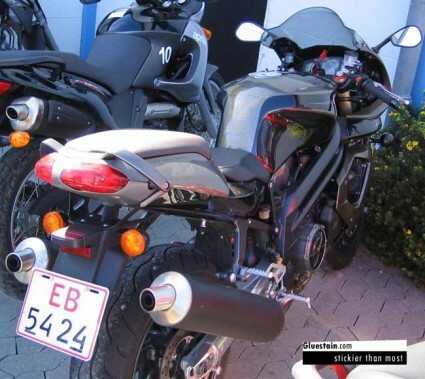 Motorcycle tryout: Aprilia SL 1000 Falco. Should you ever have the chance of riding one of those Italian V2 sports bikes, don’t deny your self the thrill. The Aprilia Falco is no exception, although not as “sport” as the Ducatis or the RSV Mille, but with plenty of pull to give you that “I’m naughty” smile inside the helmet. The 2003 model I tried had the all digital clocks, that looks like something out of a low budget sci-fi movie. Aprilia changed it for the better on the 2004 Mille (Aprilia RSV 1000 R), don’t know about the Falco but I hope so. I would seriously consider buying a Falco, but as a naked bike fan, I would have to consider the Aprilia Tuono first. Just hasn’t had the chance to try one yet. i have a aprilia Falco Sl 1000, its a lovely bike. I got lots of extra that doesnt make it look naked anymore. Helmet Hair – Motorcycle Blog	Powered by WordPress 73 queries. 0.539 seconds.